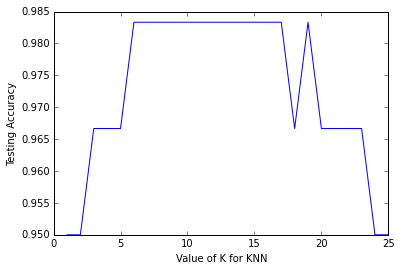 This Notebook will demonstrate the basics of using the k-Nearest Neighbors algorithm (KNN) to make predictions. The dataset is called Iris, and is a collection of flower measurements from which we can train our model to make predictions. The iris dataset is included int the Sci-kit library. It is a collection 4 dimensional vectors that map flower measurements to a flower species. For this demonstration we will use the KNN algorithm to model a flower species prediction engine. I can’t get too deep into the details of the theory behind KNN, but I can try to describe it intuitively below. Where the x axis is sepal length (cm), the y axis is petal length (cm) and the color (red/green/blue) corresponds to the species id. Also, keep in mind that the example above is presented w/ a 2D dataset while ours is 4D, the theory holds. Now let’s test this out and see if we can make some predictions! So what we are saying above, is that we have a vector X with corresponding output in vector Y, now train the model w/ these inputs so that we will have a boundary map like the image above that will allow us to make arbitrary predictions. If I convert that into a vector and feed it though the model knn it should make a prediction about species. Now I keep using the language “with a certain degree of certainty”, etc, in which I’m trying to convey that this an other machine learning/data mining models are only approximations and a degree of error exists. Let’s measure the error of our KNN. One way we can measure the accuracy of our model is to test it against the data we trained it with. Sci-kit has a convenient function to help us with that. We’re basically feeding in input for which we KNOW the correct output to measure the error in our model. In order to do this we will use the train_test_split function which will divide our dataset into 2 parts. The first part will be used to train the model and the second part will be used to test the model. Now what we could do is to feed in all all the test data in X_test and compare the results to the known answers in Y_test and then measure the error, which is the difference between the expected answer and the actual answer. Then we could compute some type of error function, such as mean-squared-error, etc. It’s only a 3.5% decrease in error, but considering it’s so close to 1 we should be happy that our model is predicting flowers at a reasonable error rate.